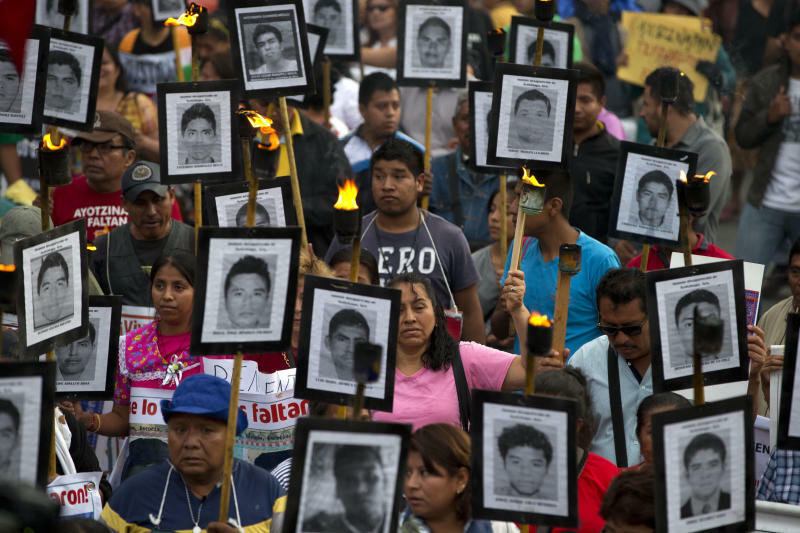 MEXICO CITY (AP) — Families of missing people swarmed Mexico's president Sunday after he vowed to ramp up efforts to identify thousands of bodies. They held pictures of their loved ones or pressed large envelopes with details of their cases into his right hand. A woman broke into tears between pleas for help. The remains of at least 26,000 people are in government custody at forensic institutions across Mexico, waiting to be identified. Thousands more Mexicans are missing, their bodies presumed to be in clandestine graves. President Andres Manuel Lopez Obrador said Sunday his government will allot all the resources and manpower necessary - "there's no financial ceiling" - to identify remains and give families some sense of closure. The task is monumental: Mexican authorities lack investigative capacity, and few crimes are solved; families themselves search unmarked graves for loved ones; and there's no nationwide database of DNA to help identify the thousands of remains collected by forensic workers. Lopez Obrador also said he feels the families' pain. Guadalupe Fernandez is one of the many mothers searching for her son. Jose Antonio Robledo Fernandez disappeared 10 years ago, while working as an engineer to build ovens for a steel company in northern Mexico. He was 32. If he's dead, she would like to at least find his remains. On Sunday, as every day, Fernandez awoke thinking of what she could do to further the investigation into her son's whereabouts. She arrived hours before the president's speech and secured a front-row seat. She took heart in Lopez Obrador's promise to meet again in three months for a progress report on missing persons, and she felt satisfied, she said, having done something for her son "even on a Sunday." "I'm going to continue to search for my son until my last breath," she said.